It's time to soccer socialize again! K+S is bringing the New York City soccerati together for another #SoccerSocialHour, our semi-regular meet-up that blends soccer, social awareness, and networking. The event will take place on Tuesday, November 11, at 7 pm, at Nevada Smiths in the East Village. 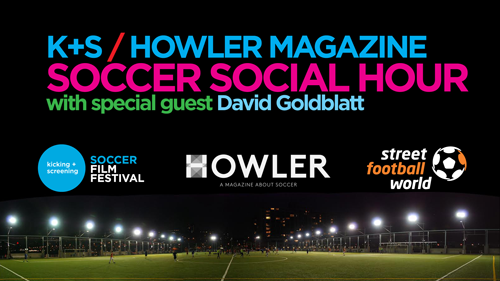 This time around, we're joining forces for the #SoccerSocialHour with the one-and-only Howler Magazine, and we'll be joined by their editor-in-chief, George Quraishi. We'll be celebrating the release of Howler's latest issue. Also joining us will be David Goldblatt, who will be celebrating the publication of his latest book, The Game of Our Lives: The Meaning and Making of English Football. Goldblatt is one of our favorite soccer writers. His previous books include Futebol Nation: A Footballing History of Brazil and The Ball is Round: A Global History of Football, among others. Please let us know if you can make it. RSVP HERE.